Popularly known as Maa Ki Daal. It has a velvety texture and is a delicacy of Punjab. 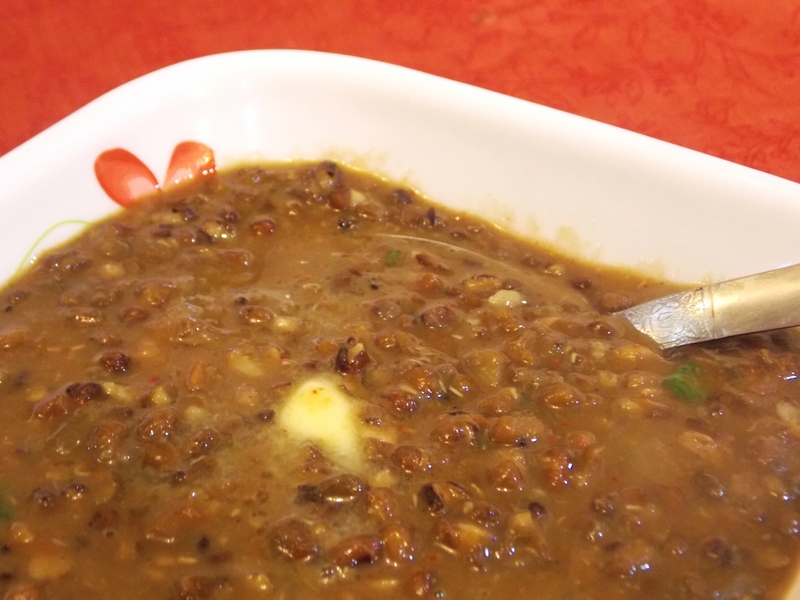 Made with a combination of Urad Dal and Rajma. Clean, wash and soak the sabut urad and rajma in 3 cups of water overnight or for at least 7-8 hours before cooking. Pressure cook sabut urad and rajma in the water they were soaked in, with salt, half the red chilli powder, chopped onions and tomatoes for seven whistles. Open the lid and see if the dals are totally soft. If not cook on low heat till the rajma becomes totally soft. Heat half the butter in a small pan and add cumin seeds. When the cumin seeds crackle, add chopped ginger and garlic, slit green chilli and the remaining red chilli powder. Add the mix to the dal. Add some water if the mixture is too thick. Add garam masala powder and salt if required and simmer for 10 minutes or till the dals are soft and well blended. Add the cream (or milk) and mix well. Simmer for 2 to 3 minutes. Serve hot garnished with the remaining butter and coriander leaves with Jeera Rice or Naan (Indian bread). A great alternative to the outside greasy dal makhani tht one orders.. Loved it.. The homemade healthiness alongwith the great taste is a deadly combination.. Great recipe..